There are nearby facilities for pony-trekking at Underhill Stables. 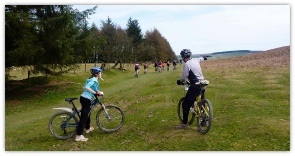 The Radnor Forest is also a very good area for mountain-biking, with an extensive network of gravel forestry roads and, for the more intrepid, many smaller interlinking single-track trails. For a change, take a trip on the scenic Heart of Wales railway line. It runs on a single track between Shrewsbury and Swansea. Our local stop, Dolau Station, is an absolute gem! Explore the nearby Victorian spa towns of Llandrindod, Builth and Llanwrtyd Wells. 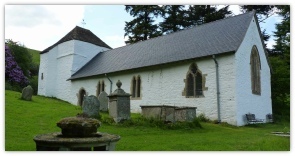 The local history of border conflict can be traced in the Offa's Dyke Centre at Knighton, and you can walk a section of the long footpath that follows that ancient line of defence separating the English March lords from the Welsh princes. Ludlow is a historic town with a fine castle and a lively market. There is another castle at Stokesey. Hereford and Shrewsbury are also within easy reach. It’s not far to the Elan Valley with its picturesque reservoirs. On the way, at Gigrin Farm near Rhyader, you can watch the spectacle of red kites being fed. Or you could go to Hay-on-Wye and spend the day browsing in second-hand bookshops (once you've read all the ones we've left in the cottage). 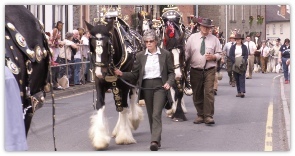 Keep an eye out for local events and festivals, from the Royal Welsh Show to ‘Sheep Music’ community events. But don't rush around too much! 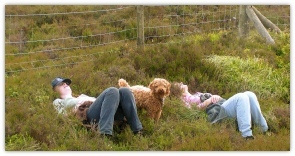 The trails start right from the door, up through the woods and onto the Radnor Forest moor. We keep guides to some local walks in the cottages. 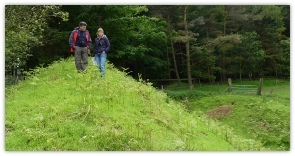 For the more determined, there are several long-distance walking trails. The best-known is the Offa's Dyke Path, but there is also Glyndwr's Way, the Mortimer Trail, and the Wye Valley Walk in the vicinity. One local beauty spot is "Water-break-its-neck".